Wow! Create luxurious lace with your 5" x 7" hoop! It's fast, easy and an inexpensive way to update your wardrobe! Look fashionable, feminine and smile with a sense of accomplishment knowing you transformed plain tee-shirts, tanks and long sleeved shirts using the Little Black Tee. The Little Black Tee makes it easy to add luxurious lace -- in any color using your 5" x 7" hoop! If you've been out shopping lately you know how difficult it is to find 'designer' clothing at affordable prices and that's comfortable enough to wear. Well ladies, the search is over! 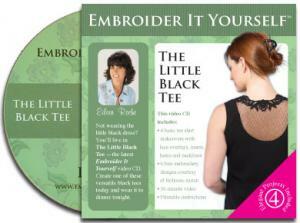 The Little Black Tee Project and Video CD makes it easy to update a garment with embroidered lace. 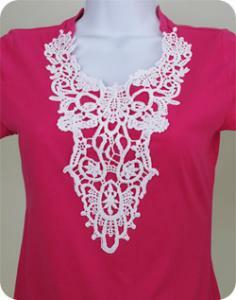 Think bold fresh colors for Spring by choosing colorful t-shirts and pairing it with white embroidered lace. For a more subtle approach, choose tone-on-tone colors like white, ecru or soft pastels. Eileen Roche will share her multi-hooping techniques and her tips for embroidering on delicate and stretch fabrics. You'll discover once you stitch one garment you'll want to stitch an entire wardrobe! The Little Black Tee will give you the confidence to be a creative designer with your embroidery machine. Think beyond a black tee and embrace shades of colors! Here's the perfect opportunity to use your variegated threads. Don't confine yourself to tee shirts! Update a plain tank top with a delicate touch of lace. Strike the perfect balance by pairing a bright colored tee shirt with delicate white embroidered lace.